What is the purpose of these instructions before the main preamble? What are the first three instructions before push %ebp doing? I haven't seen those in older gcc compiled binaries. What are the first three instructions before push %ebp doing? This is easy to see if gdb (or some other debugger) is used to step through the code. This means that the lea instruction loads the effective address of 0x4(%esp), 0xffffd140, into $ecx. 0xffffd13c - 0x0c = 0xffffd130. This is done to keep the stack aligned to a 16-byte boundary, since the next instruction (see 3) decrements the stack pointer by 4 and then saves a value to the stack. -0x4(%ecx) = 0xffffd140 - 4 = 0xffffd13c. This was the value of $esp at the beginning of main(). This value is now saved on the process runtime stack via a pushl instruction. 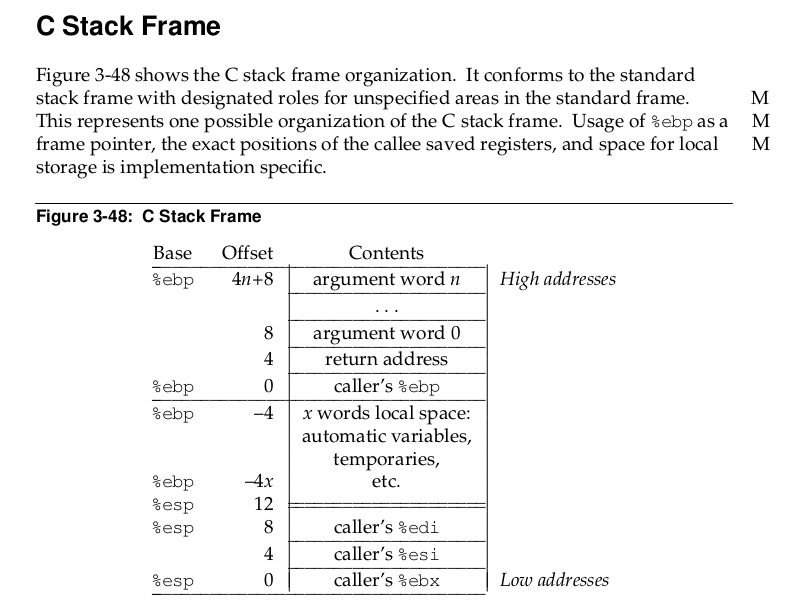 According to the System V Application Binary Interface Intel386 Architecture Processor Supplment, Fourth Edition, after the execution of the function prologue $ebp+4 is the location on the runtime stack of the return address. 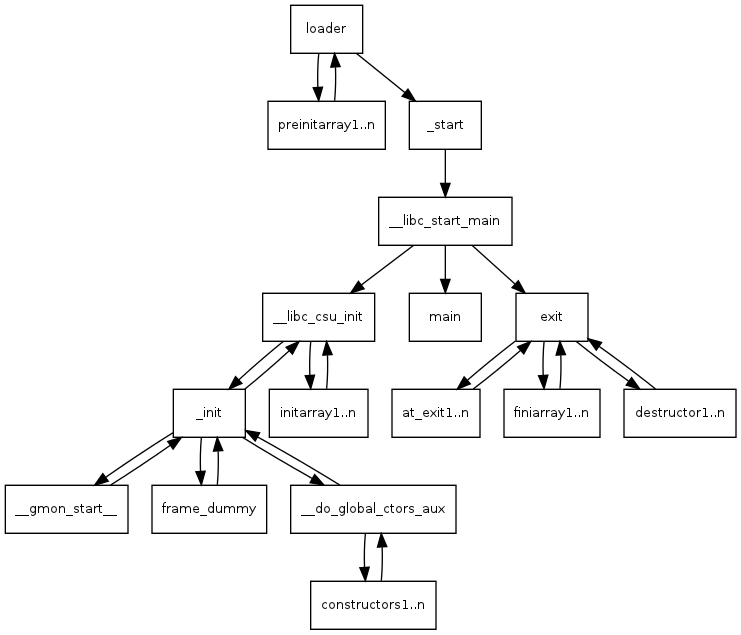 This indicates that the return address of main() is in function __libc_start_main(). Note that since variable a is never used, the compiler optimizes out the call to atoi. 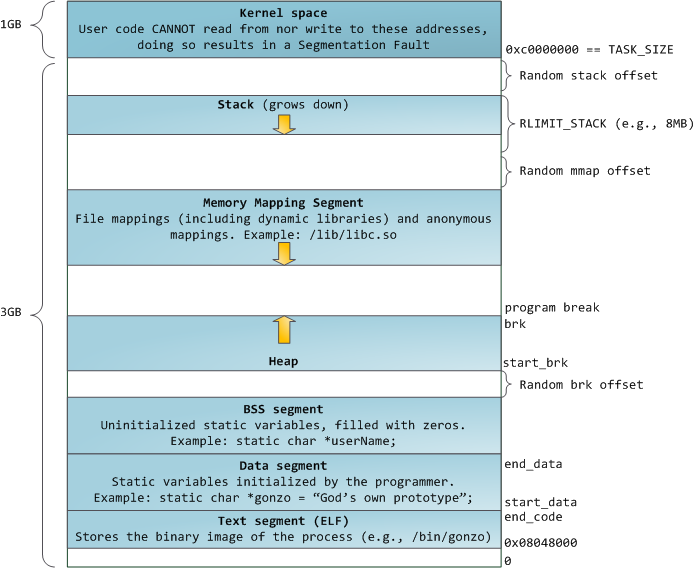 So to answer the question directly, the instructions in main() prior to the prologue pass an argument to main() (the value of argc) and save the return address of main() on the runtime stack. The __libc_start_main() function shall initialize the process, call the main function with appropriate arguments, and handle the return from main(). These three statements serve to move the stackframe of main, beginning with its return address, to the next 16-byte-aligned address. At the same time, the arguments to main (argc and argv) are not moved, so a pointer to them is saved in %ecx. The arguments sit right above the return address, so %esp+4 is saved to %ecx before the stack pointer is adjusted. Next, %ecx also serves as our pointer to locate the original return address, -4(%ecx), which we push to our new stack frame. ret                      # jump out, using the original return address! Why is all this done at all? Modern processors like data aligned to 16-byte boundaries for various reasons; some operations may take significant performance hits otherwise, others might not work at all. NB: The x86-64 ABI makes the 16-byte stack alignment mandatory. Incidentally this means that you will not find a frame adjustment on main in 64-bit code - the stack is already aligned. Not the answer you're looking for? Browse other questions tagged disassembly x86 gcc or ask your own question. GCC adds code involving `ecx` in main? What purpose of mov %esp,%ebp? What do the following ARM instructions mean? What is the difference between these two function prologue instruction sequences?